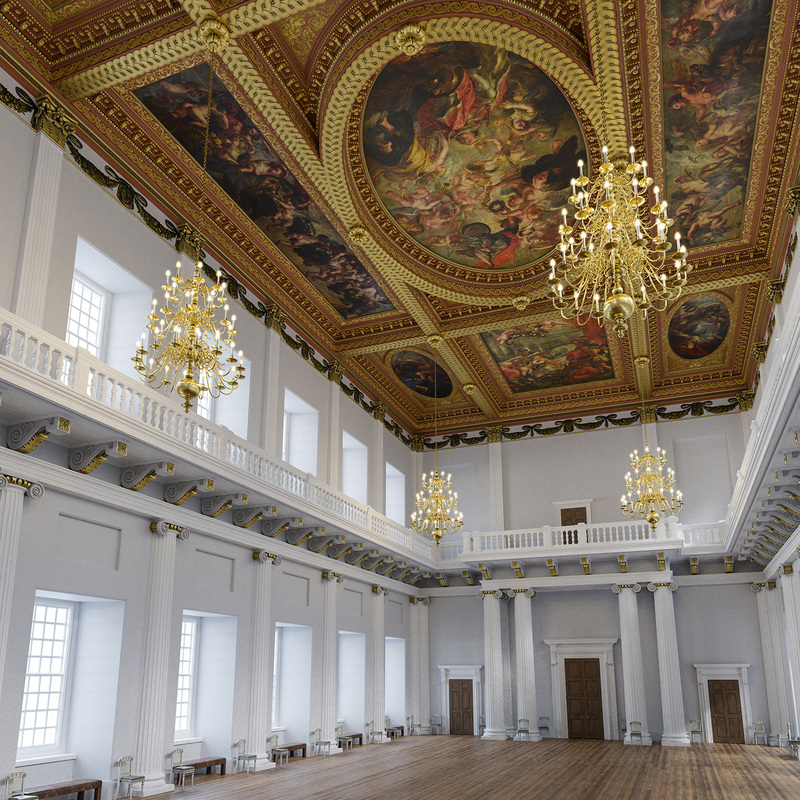 As part of important conservation work, Historic Royal Palaces commissioned me to produce these 3D model reconstructions of the Banqueting House to visualise how its historic ceiling originally looked. 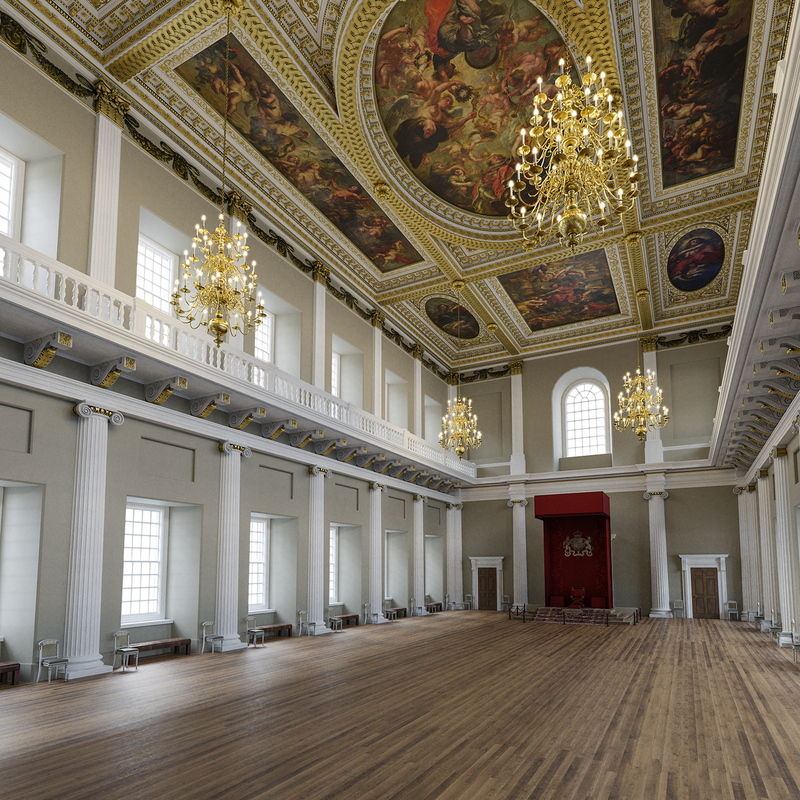 Designed by the architect Inigo Jones and completed in 1622, the Banqueting House is the only remaining component of the original Royal Palace of Whitehall. 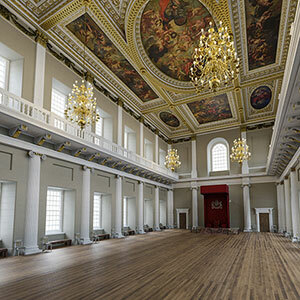 The building was to transform English architecture - it was the first structure to be completed in the neo-classical style influenced by Andrea Palladio. 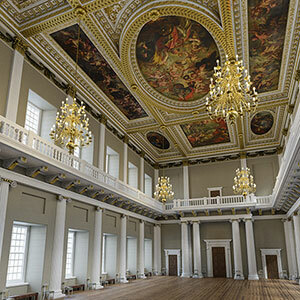 Charles I became a great patron of the arts and encouraged the great painters of Europe to come to England. In 1636 the King commissioned a spectacular gilded ceiling with nine paintings to glorify his father, James I. Titled ‘The Apotheosis of James I’, they were painted by the Flemish artist Peter Paul Rubens - one of Europe’s most influential and important artists of the time. 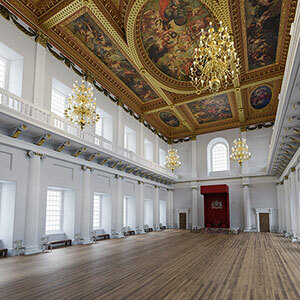 The ceiling was painted plain white before Rubens' paintings were installed but was darkened with 'walnut-tree' colour and richly gilded after their installation. 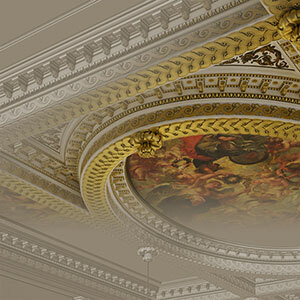 For this project I produced two computer renderings of the interior with its present day and historic colours. Colour samples of the underlying paint extracted during conservation work were the references used to make these renders. The 3D model was created from measured survey drawings provided to me by Historic Royal Palaces. I used Blender 3D for the modelling and Photoshop and Substance Painter for the painting and texturing detail. 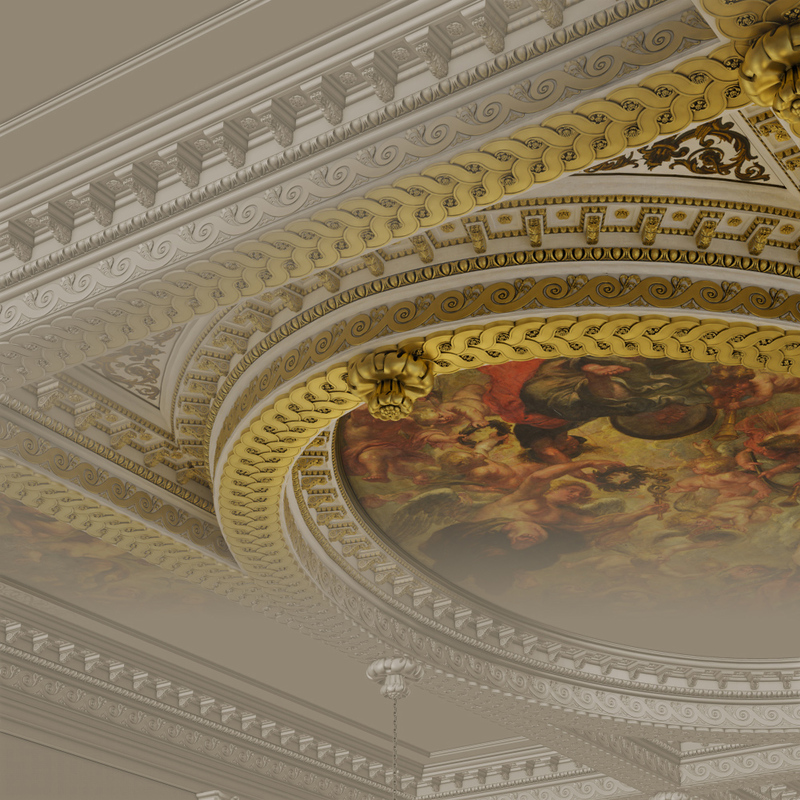 The modillion cornicework and guilloche ornamental soffits were achieved using Blender's array and curve modifiers. Historic Royal Palaces also provided me with high-resolution images of the nine Rubens paintings so I could 'map' these accurately onto my ceiling panels. These 360-degree panoramic images were not part of my original commission. I produced them only as an experiment. The images have been digitally compressed to make the file sizes small enough to download and this results in a small reduction in visual quality. The panoramas each use six high-resolution cubeface images. The total file size of each panorama is around 10MB. Please allow a few moments for each scene to load. Click and drag with your mouse over the image or use your keyboard arrow keys to rotate the scene. Use your mousewheel or + - keys to zoom in and out. Click on the fullscreen button for the best viewing experience and if you are using a mobile device or a tablet, click on the VR button and point or tilt your device to observe the room in Virtual Reality mode. Software used: Blender 3D, ZBrush, Substance Painter, B2M, Photoshop, Illustrator.